My house may not be the USS Enterprise, but lately, I feel as if I’m Captain Kirk of the Star Trek series battling the infamous Klingon clan, but I’m calling my new nemesis, “Baby Cling-On”. My 16-month-old daughter talks very little, makes a guttural noise while pointing to something that she wants, and clings to my leg a good portion of our day. I don’t know if my 42-year-old mommy brain has left me in a state of a constant fog or if too much time has passed since I was at this same stage with my son, but I don’t remember it being like this with him. My children are almost four years apart so it is possible that I have forgotten some things. I do know that some of the things that I did for him such as giving him his own kitchen cabinet to explore while I cooked dinner kept him occupied and happy, whereas, she hates that same cabinet. As soon as I try to put her in front it, she throws a “toy pan” across the room, stomps her feet, and heads toward my spice rack cabinet, which is off-limits. Certain times of the day, her clinginess is worse. Usually as the day winds down, I have an even longer list of things that I didn’t get accomplished because she was attached to my pant leg. Like any good mom, I work to engage her in play, and then back away slowly in hopes of finding her in total playtime bliss. However, by the time, I reach for that shirt to fold, she’s back on me with vengeance. I’m getting fairly good at walking with a toddler straddled to my leg while folding laundry, putting on my make-up or even making the bed. For really complicated maneuvers like preparing her lunch before her nap, I’ve learned to do everything with one hand with my daughter sitting on my left hip. Depending on my daughter’s mood, and if she is tired of playing, it is not uncommon for me to finish the last five minutes of my exercise video this way, too. I’m secretly hoping that carrying the extra twenty pounds will make up for that little piece of chocolate I sneak in my mouth during her naptime. It’s my reward for getting rid of my “static-cling”. Preparing dinner can be a little challenging when there is a “Baby Cling-on” in the house. I sometimes rely on my five-year old son to help me out while I do some chopping or sautéing. Sometimes, he is help, and other times, I’m asking for more trouble. I often find “Baby Cling-On” clinging onto a toy that my son claims he had first. That doesn’t end well. My daughter may balk at first, but sometimes, dinner preps can be a success if I can get her in her booster chair, and let her munch a little. On occasion, she’ll put up a fight, arch her back, and stiffen her legs as a way to avoid sitting, but a good Starship Captain is always prepared. 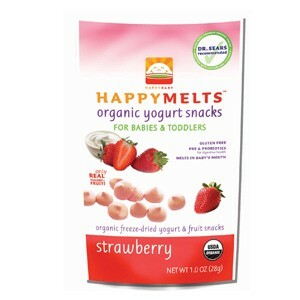 One shake of the “HappyMelts Organic Yogurt Snacks” package, and “Baby Cling-On” surrenders. I’m sure Baby “Cling-On” will soon turn into “Miss Independent.” and I’ll have a whole new set of problems on my enterprise and still not get many things done in a day. I think that may just be part of parenthood! Who Wants To Eat One of Fiona's Cakes? Playing Hard and Eating Well! I Need My Hour Back, Please! Shake It, Baby, Shake It!